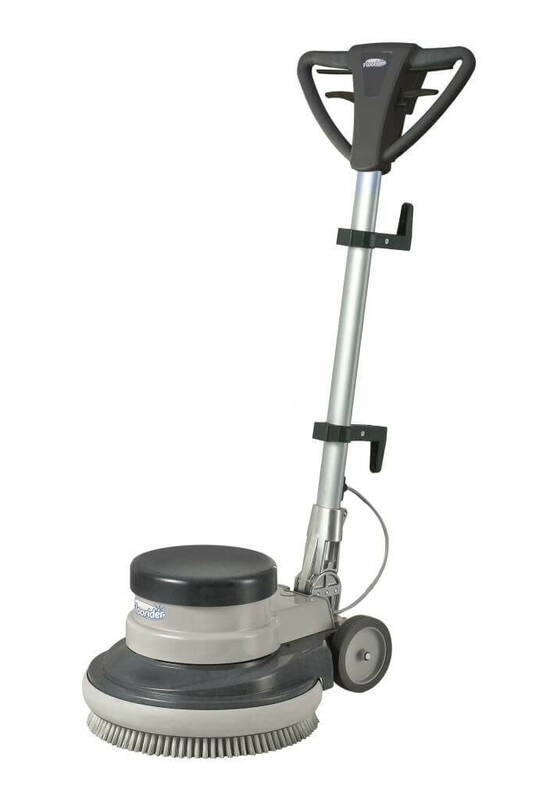 Model with working width of 430 mm and double speed, equipped with pad holder, suited for many cleaning tasks from cleaning of very dirty floors up to the maintenance cleaning of floors treated with metallic waxes. A single machine and a simple switch replaces 2 separate units, with evident advantages in terms of practicality and economic convenience. Very strong induction motor for long lifetime and great performances. Double protection against unintentional start. Satellite and planetary gearbox for high power transmission, long lifetime and low noise level. Coupling for both pad holder and brush. Handle of last generation, result of a perfect synthesis among great sturdiness, ergonomics, safety and innovative design. Working width : 430mm / 17"
Latest generation model, designed for fatigue-free operation even during long working periods. The handle of the new Wirbel single discs is articulated, robust and safe, with a very resistant and comfortable grip where all the controls can be put into action without moving the hands from the working position. The Single Discs 17” cover almost all the needs of the professional sector in terms of cleaning, treatment and restoration of all kind of hard floors (wooden floors, marble, stone and fine stoneware).